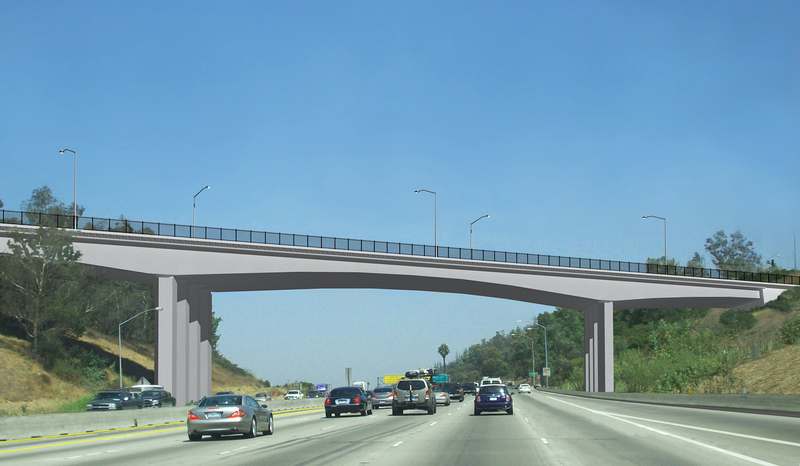 A rendering of the new Mulholland Drive bridge over the 405 freeway. Some news broke late last week involving the I-405 Sepulveda Pass Improvements Project: The Mulholland Drive bridge over the freeway will indeed be rebuilt in its original location — as was originally planned. There had been a push by some members of the community and officials to build a new bridge south of the current one, which would allow the current bridge to remain open during construction. A new bridge could have significantly reduced construction impacts on traffic. But there were complications — including the threat of litigation — that could have also significantly delayed the entire 405 project, which is adding a carpool lane to the northbound side of the freeway and upgrading on- and off-ramps along the 405 corridor between the 10 and 101 freeways. As is, the project is scheduled to be complete in 2013. As a result, the project planning staff decided to stick to the original plan, which is to tear down the bridge and rebuild it in its current location. Here’s a story about the decision in the Daily News. Long-term effects on traffic would include traffic flow across the bridge being reduced by one lane during 25 months of bridge reconstruction and utility movement. At other times, utility relocation would sometimes require full closure of the bridge. Caltrans anticipates these closures would result in a geometric increase in travel times in the Los Angeles County travel network, particularly for drivers trying to access the Getty Center, Los Angeles International Airport, Skirball Cultural Center and the University of California, Los Angeles, as well as other businesses and schools. Access to the Westside and San Fernando Valley would also be diminished. Does it have to stay so utilitarian looking?